A team led by Dante Minniti (Universidad Andrés Bello, Santiago, Chile) and Rodrigo Contreras Ramos (Instituto Milenio de Astrofísica, Santiago, Chile) used observations from the VISTA infrared survey telescope, as part of the Variables in the Via Lactea (VVV) ESO public survey, to carefully search the central part of the Milky Way. By observing infrared light, which is less affected by cosmic dust than visible light, and exploiting the excellent conditions at ESO's Paranal Observatory, the team was able to get a clearer view of this region than ever before. They found a dozen ancient RR Lyrae stars at the heart of the Milky Way that were previously unknown. RR Lyrae stars are typically found in dense globular clusters. They are variable stars, and the brightness of each RR Lyrae star fluctuates regularly. By observing the length of each cycle of brightening and dimming in an RR Lyrae, and also measuring the star's brightness, astronomers can calculate its distance . Unfortunately, these excellent distance-indicator stars are frequently outshone by younger, brighter stars and in some regions they are hidden by dust. 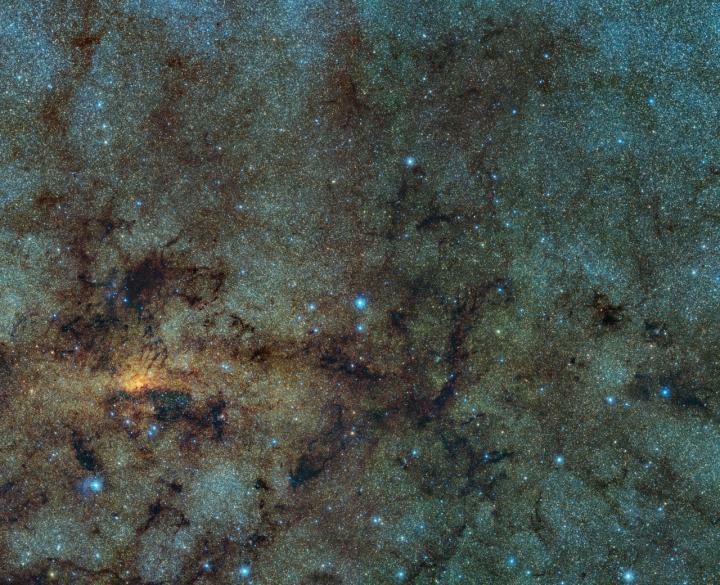 Therefore, locating RR Lyrae stars right in the extremely crowded heart of the Milky Way was not possible until the public VVV survey was carried out using infrared light. Even so, the team described the task of locating the RR Lyrae stars in amongst the crowded throng of brighter stars as "daunting". Their hard work was rewarded, however, with the identification of a dozen RR Lyrae stars. Their discovery indicate that remnants of ancient globular clusters are scattered within the centre of the Milky Way's bulge. Rodrigo Contreras Ramos elaborates: "This discovery of RR Lyrae Stars in the centre of the Milky Way has important implications for the formation of galactic nuclei. The evidence supports the scenario in which the bulge was originally made out of a few globular clusters that merged." RR Lyrae stars, like some other regular variables such as Cepheids, show a simple relationship between how quickly they change in brightness and how luminous they are. Longer periods mean brighter stars. This period-luminosity relationship can be used to deduce the distance of a star from its period of variation and its apparent brightness. This research was presented in a paper to appear in The Astrophysical Journal Letters.